Istra has perfect conditions for learning how to fly. We have abundance of student friendly training sites and hill launches facing almost every wind direction, all within an hours drive. The soft mediterranean climate enables us to fly all year round. The Paragliding School Chief Flight Instructor Airie has started paragliding in 1996 and has since accumulated thousands of hours of airtime, making him one of the most experienced paragliding pilots in Croatia. ​The course is incorporating the latest PG techniques, giving the student access to the most efficient and quickest way of learning how to Paraglide in the safest way possible. Through daily practice and progression the Student develops the ability to fly the paraglider without needing to think about what needs to be done. The course helps the participant develop the right muscle memory, enabling active and intelligent handling of the paraglider. It's like martial arts timing - instantaneous, bypassing the mind's need to analyse things, enabling the practitioner to be fully present in that moment of time. Before the start of the course the Student needs to obtain Class 2 medical certificate. Our 16 days Learn to Paraglide course Overview and Progression - All aspects of our course are conducted on site ! Introduction to the Sport : License legals, Rules and regulations, course overview etc. Equipment explained : All aspects and parts of the glider and harness are explained in a detailed session. Ground Handling : Forward and Reverse Launch, learning to handle the glider in varying launch wind conditions. Tandem High Flights : We are one of the few schools that includes Tandem Flights prior to a students first solo High Flight. This improves confidence and introduces various types of landing approach and some aspects of ridge soaring and thermalling. Solo High Flights : From 550m Raspadalica take off or 163m Kastelir take off under full radio control with instructors at the top and bottom to safely guide you all the way. One of the most rewarding experiences you can have to fly solo for the first time from a high mountain. Landing Approaches : Depending on conditions and situation 2 types of landing approaches are used - "aircraft circuit" and "figure 8" (base line). Thermalling : We are one of the few schools that actively teaches you in theory and practise how to fly and use thermal lift in the novice license course (created by columns of hot air rising). A must for doing XC flights later on. Big Ears : a height loss and stability manoeuvre. An important and required skill. Rear Riser Steering : an method used in case the brake lines are jammed or inoperable due to knots or broken lines. Top Landing : when conditions allow, full radio control to demonstrate this Intermediate level skill where you land back on top near the launch area in the ridge soaring conditions. 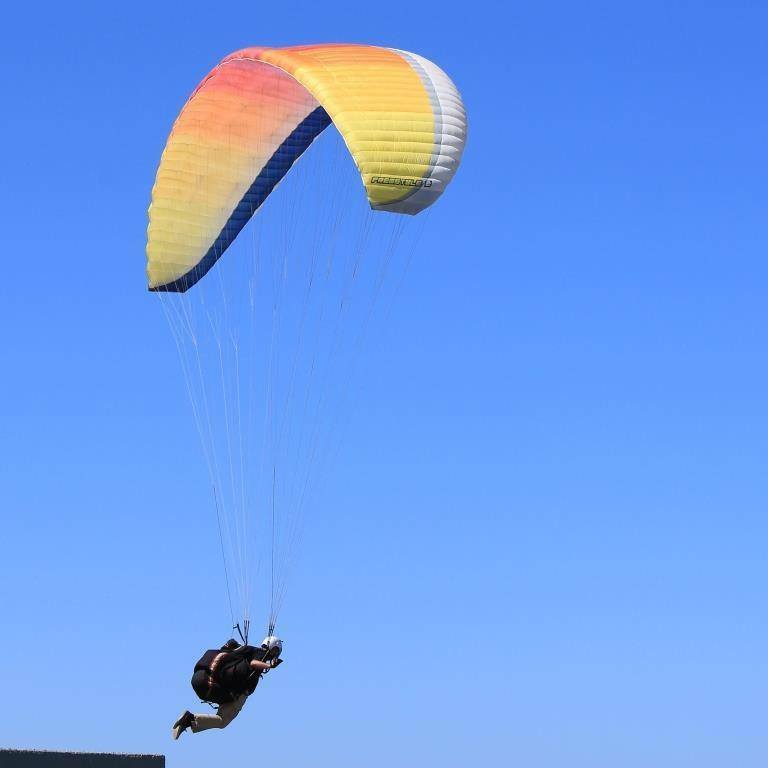 Cross Country (XC) Theory : Learning how to use thermal lift allows you to eventually fly XC which is the aim of many that take to the skies in a paraglider. Theory Lessons & Theory exam: Approx 13hrs of real classroom theory covering all the minimum topics required and a whole lot more that no other schools teach. An 80 question theory exam needs to be passed at the end of the 2nd week. Practical Exam: A practical exam needs to be passed at the end of the 2nd week. Included Extras - additional important skills noted above (that most other schools don't do) include : top landings when conditions allow, detailed emergency situations theory, and basic thermalling and cross country (XC) theory tuition. The price of the course is 7500kn. I will never forget that feeling when my feet left the ground for the first time.